What Are The Advantages And Disadvantages Of Eating Ice Cream? Although ice cream is an energy-dense food packed with fat and carbohydrates, it can also be a good source of calcium, phosphorus, and vitamins (especially vitamin A), with small amounts of protein. However, since ice cream contains dairy milk sugar (lactose), lactose-intolerant individuals may develop indigestion, abdominal cramps, excess flatulence, diarrhea, etc. Nearly everyone loves ice cream! According to a study conducted by Eccles R et al at Cardiff University, the author suggests that the reasons for this fondness is due to its thirst quenching property, a general attribute of all cold foods, as well as the refreshing effect it produces. It is reported that another reason for indulging in ice cream is its higher fat and sugar content. Although ice cream is an energy-dense food packed with fat and carbohydrates, it can also be a good source of calcium, phosphorus, and vitamins (especially vitamin A), with small amounts of protein. In fact, ice cream can be a delicious medium to deliver these nutrients for those who find milk distasteful. As per Unilever corporate company statistics, Americans are the second highest consumers of ice cream in the world. Cheaper supermarket ice creams, and sometimes even premium brands, may contain ingredients like vegetable oils with an unhealthy amount of saturated fat (coconut oil, palm oil), mono and diglycerides. The quantity of saturated fat present in half a cup (120ml) of a major brand of butter pecan ice cream is approximately 50% of the daily value and 27% of the daily value of cholesterol. In other words, half of the saturated fat required for a day can be consumed with just a small volume of ice cream. Individuals consuming high quantities of saturated fat and cholesterol are at risk for obesity-related and heart-related diseases. Children consuming excess sugars are also at risk for developing childhood obesity and dental cavities. 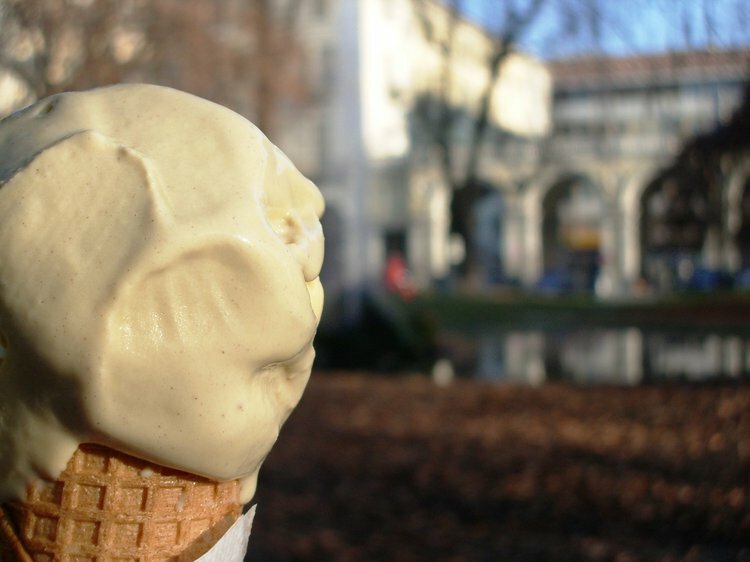 Lower quality ice creams may also contain unhealthy or even toxic chemicals as ingredients or fillers, although they are ‘generally recognized as safe’ by the FDA. Such chemicals include, but are not limited to, artificial sweeteners, artificial colorants, artificial flavorings (like vanilla), preservatives, polysorbate 80 (used in cosmetics), diethyl glycol (used as anti-freeze), ethyl acetate (used as cleansing agent for textiles), gum, etc. Moreover, more and more artificial substances are increasingly replacing natural ingredients present in the traditional ice cream. To make it worse, the FDA does not require the product makers to list all of their ingredients on the pack. Thus, consumers may not be fully aware of the potentially harmful substances they may be ingesting through ice cream. Since ice cream contains dairy milk sugar (lactose), lactose-intolerant individuals may develop indigestion, abdominal cramps, excess flatulence, diarrhea, etc. Additionally, nuts or additives present in the ice cream may trigger allergic reactions in susceptible individuals. Consumption of improperly prepared or handled ice cream and/or contaminants can cause bacterial food poisoning. Common microorganisms are Staphylococcus, E. coli, Bacillus cerus, Yersinia enterocolitica, and Salmonella enteritidis. According to a study conducted by Ismail N et al at Universiti Kebangsaa in Malaysia, excessive consumption of dairy products, including ice cream, combined with other factors, such as an individual’s family history, have been linked to the development of pimples (acne vulgaris) in some individuals. Having ice cream can cause headaches, particularly in individuals with a history of migraine headaches, due to irritation of branches of the trigeminal nerves present in the mouth cavity. This commonly occurs when ice cream is consumed in a hurried manner, especially in hot weather. In summary, ice cream may be bad for you, as it is high in calories with high saturated fat and cholesterol content. It has the potential to cause food poisoning, ice cream related headaches, and even cause the formation of pimples. Ice cream may also contain lactose, unhealthy additives and chemicals, and certain allergens like nuts. A proper awareness of the ingredients on labels when choosing ice cream and consumption in moderation is the key to minimizing the potential harmful effects of ice cream, even while treating your taste buds to this refreshing, cool delight. Eccles R, Du-Plessis L, Dommels Y, Wilkinson J. Cold pleasure. Why we like ice drinks, ice-lollies and ice cream. Appetite. 2013;71:357--360. Ismail N, Manaf Z, Azizan N. High glycemic load diet, milk and ice cream consumption are related to acne vulgaris in Malaysian young adults: a case control study. BMC dermatology. 2012;12(1):13. Fetsch A, Contzen M, Hartelt K, Kleiser A, Maassen S, Rau J et al. < i> Staphylococcus aureus</i> food-poisoning outbreak associated with the consumption of ice-cream. International journal of food microbiology. 2014;187:1--6. Fuh J, Wang S, Lu S, Juang K. Ice-cream headache--a large survey of 8359 adolescents. Cephalalgia. 2003;23(10):977--981. Wansink, B., Van Ittersum, K., & Painter, J. E. (2006). Ice cream illusions: bowls, spoons, and self-served portion sizes. American journal of preventive medicine, 31(3), 240-243. Van Strien, T., Cleven, A., & Schippers, G. (2000). Restraint, tendency toward overeating and ice cream consumption. International Journal of Eating Disorders, 28(3), 333-338. Prindiville, E. A., Marshall, R. T., & Heymann, H. (2000). Effect of milk fat, cocoa butter, and whey protein fat replacers on the sensory properties of lowfat and nonfat chocolate ice cream. Journal of dairy science, 83(10), 2216-2223. Prindiville, E. A., Marshall, R. T., & Heymann, H. (1999). Effect of milk fat on the sensory properties of chocolate ice cream. Journal of Dairy Science,82(7), 1425-1432.